It takes virtuoso-artistry to ace the just-right balance between sophistication and comfort in the fabulous world of hospitality. If Goldilocks were out on a tasting spree sampling the porridge bowls of the hospitality greats in and around Cape Town, O on Kloof would be bound to earn her satisfied pronouncement of “just-right”. 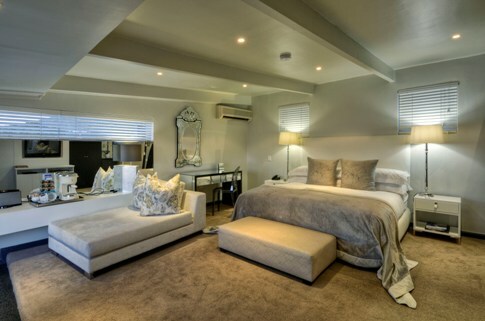 Chic and sophisticated yet wonderfully warm and homely, O on Kloof is an “Oh so lovely” five-star accommodation choice in Cape Town. 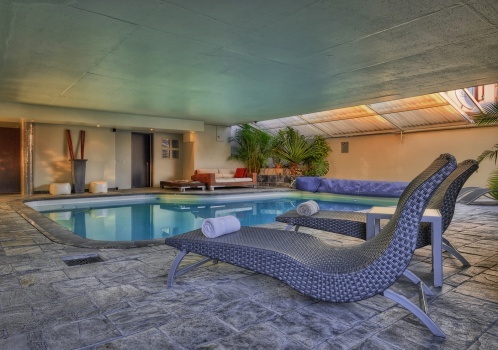 This gorgeous holiday haven has a prime corner on Kloof Road in the hotspot of Bantry Bay, lording it over grand views of the Atlantic Ocean. Not far away, the Mother of all South African cities pulses, bustles and beats its irresistible rhythms. And scenery comparable with the best in all the world, waits for you. Ascending the steps to this chic little urban haven is simultaneously a ‘red-carpet’ moment and an easy-going entry to a classy holiday-sanctuary. Actually, it’s the kind of place you could easily want to put your luggage down deliberately enough to want to stay forever. The champagne is always on ice, ready to mark the magic of the moment, in gestures that make absolute truth of the claim that here, “every moment is an occasion“. Days are extraordinary, sunsets are fiery and sublime, and one-of-a-kind cocktails get mixed in your honour! Wow. O on Kloof’s people are, in a word, magnificent. 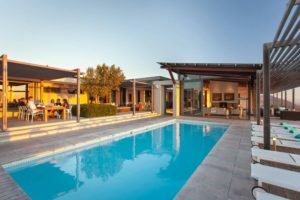 Warm, welcoming and intent on making your stay a celebration of the good life in Cape Town, they receive you amid the clinking of glasses and are eager to make you supremely comfortable in a world’s-best city. The rooms are chic and luxurious, and each is different with its own extra-special features to fall in love with. In-room luxuries of mini-bars, dvd players and ipod docking stations (and more) are standard. The art is bold and beautiful, and rather celebratory. The cherry on the top is the O’Suite. 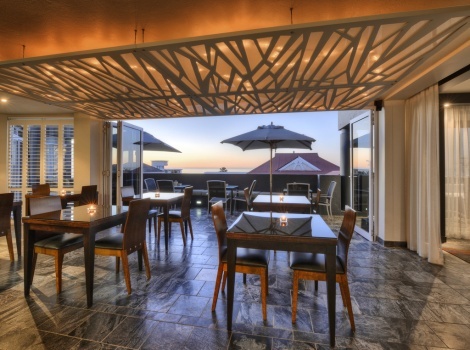 It’s an exclusive private suite with the kind of views of the ocean and mountain that probably drew you to Cape Town in the first place. 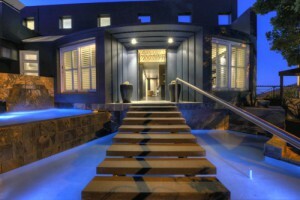 It has its own sundeck and jacuzzi, so just kick back and allow the views to enchant you. 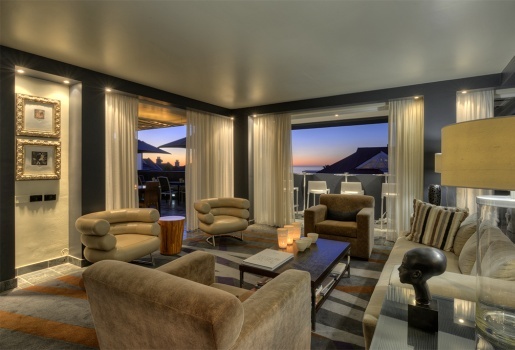 The lounge and library are heavenly chillout-spaces, just perfect for plotting your next gadabout in Cape Town. You couldn’t be blamed, in fact, for wanting to go no further than the slick comforts of O on Kloof, but sooner or later, Cape Town’s dizzying delights will call you. O’ Restaurant is your feasting spot for sublime dinners on Mondays, Wednesdays and Fridays. multitude of excellent eateries in the vicinity. The choice is limitless. The Milk & Honey Spa is a little dream-spot for body pampering. Pick and choose your delights off the spa menu and enjoy the fabulous contentment offered by large heated pool. 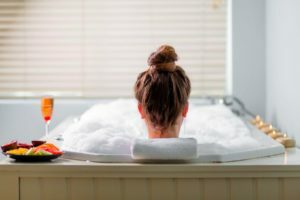 Whether you opt for the big goodie bag of a deluxe spa ritual lasting 3 glorious hours, or pick a somewhat more express treatment, your experience is bound to be special. Mail us to book, or call +27 21 797-7122.